The formation of atheromatous plaque is caused by bad cholesterol (LDL) and is called atherosclerosis. Atheroma (fat plaques) caused by excess cholesterol occurs insidiously over years and can lead to the obstruction of one or more arteries. These fat plaques accumulate on the inner wall of the arteries causing a thickening, hardening and a reduction in their elasticity. Atheromatous plaque is made up of blood cells and bad cholesterol. Atheromatous plaques affect arteries, specifically those supplying the heart, the brain and the lower limbs. The atheromatous plaque is formed in the carotids, these arteries located in the neck. The blocking of this artery reduces the blood flow supplying the brain, causing faintness or loss of consciousness. A cerebral vascular accident happens when an artery is completely blocked, and oxygen can no longer get to the brain. Atheromatous plaque builds up in the arteries supplying the heart. 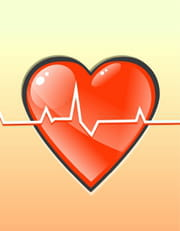 It causes narrowing which, leads to a decrease in oxygen to a part of the heart. This partial blocking of the artery causes angina. When there is a complete blockage it causes a heart attack (myocardial infarction). Pain and difficulties in walking especially in the calfs or thighs, which can also occur at night and at rest. The formation of atheromatous plaque in the penile arteries can cause impotence, which is called erectile dysfunction. Smoking, diabetes, a sedentary lifestyle, hypertension, obesity, poor diet and hereditary factors. Monitor your weight and if overweight, make lifestyle changes to loose weight. Have your cholesterol levels regularly checked. Latest update on October 17, 2010 at 07:09 AM by Janey39. This document, titled "Health consequences of raised cholesterol," is available under the Creative Commons license. Any copy, reuse, or modification of the content should be sufficiently credited to CCM Health (health.ccm.net).